The test set debuted in August 2014 at Vassell Station in Ohio. The contraption looks like the creation of a mad scientist straight out of an early sci-fi or James Bond flick. Looks aside, the awkward two-spired, bug-eyed beast purchased by AEP Transmission is the latest and, at 1.3-megavolts, likely the world’s largest device of its kind on wheels. 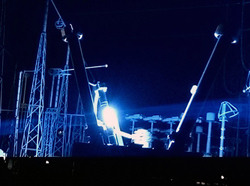 Engineers at AEP’s Dolan Technology Center (DTC) and AEP Transmission helped Phenix Technologies design, the 34-foot tall test set, which debuted in August 2014 at Vassell Station, prior to the station going into service. It traveled there on a pair of flatbed trailers to double-check the operation of the station’s 765-kilovolt (kV) circuit breakers. Before the end of 2014, it had tested circuit breakers at Wyoming Station in Clear Fork, W.Va.; Marysville Station in Ohio, Mountaineer Station in New Haven, W.Va.; and Gavin Station in Cheshire, Ohio. At the test location, the test set is erected by crane. The manufacturer, Phenix Technologies, is located in a western Maryland town curiously called Accident (population 325). As the name suggests, its main purpose is to test the reliability of 765-kilovolt (kV) circuit breakers. (It can test lower-voltage circuit breakers and other equipment too.) The new test set resides in a new steel pole building at DTC. AEP Transmission purchased the test set to support its 2,100-mile 765-kV system, the nation’s largest 765-kV network. Hauling the apparatus to a station is more efficient than taking the breakers to DTC, located some 12 miles southeast of downtown Columbus. This winter the test set returns to Mountaineer Station and then travels to Dumont and Sullivan (Indiana), Jackson’s Ferry and Cloverdale (Virginia), Amos and Kammer (West Virginia) and North Procterville (Ohio) stations in 2015 and beyond. When the test set reaches the station, a crane helps erect it into position. A crew from DTC leads the assembly and operation of the big unit. The thin tower is the voltage divider used to measure the output voltage of the test set. The red and tan structure is the high voltage source. A diesel generator produces the electricity that the test set transforms into the extra-high voltage electricity required for tests. The test for a 765-kV circuit breaker, for example, involves attaching bus work to the bushings of the equipment, giving it a jolt up to 960-kV, and then evaluating the response. 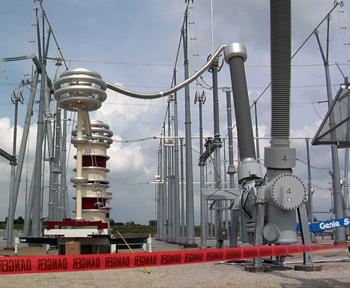 (Sometimes the test voltage is less than 960 kV, depending on the required safe distance from nearby energized equipment.) If the equipment works as designed and does not “fault” under the additional voltage stress, then it is good to go into service. During testing at Mountaineer Plant in November 2014, the test set indicated a malfunction when a bushing flashed. The company has relied on a 500-kV test set to test 765-kV rated equipment, though it barely provides enough voltage for optimal results, according to Bob Burns, DTC manager. That unit, now several decades old, still can be used as a 765-kV backup unit and for testing equipment with lower kilovolt ratings. The new test set may have already paid for itself. During testing at Mountaineer Station last November 10, a bushing flashed, indicating a malfunction. An investigation showed that a desiccant bag strapped to the bushing stem had not been removed during field commissioning (circled in photo below). Burns said the 500-kV test set may not have issued enough voltage to cause a flash, meaning the breaker could have been energized with a faulty bushing only to fail later. 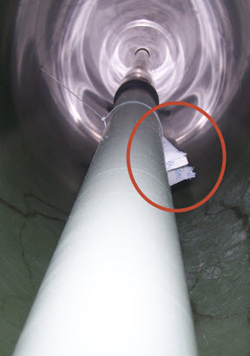 An investigation of the bushing flash at Mountaineer found a desiccant bag (circled) that had not been removed during commissioning. Skidmore calculated that later repairs to the breaker could have cost $300,000 up to $5 million, depending on the amount of damage that could have happened to other equipment. The vendor replaced the bushing at no cost to AEP. So far, the test set has serviced stations in AEP’s eastern territory, but it could travel to stations out west. There also could be opportunities for other parties to use the test set; so it may become a source of revenue. See a video on the assembly of the new test set at DTC. 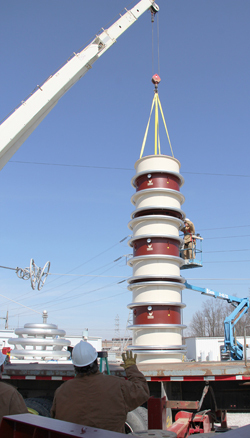 AEP helped design the first 1.3 megavolt portable resonant test set in North America for use on 765-kV circuit breakers. It has an output frequency range of 18-300 hertz. The test set is stationed at AEP's Dolan Technology Center near Columbus.